How did you first hear about FloCrit, and what made you interested in volunteering?Pinnacol works closely with many entities in Colorado, including Denver Public Schools. Through our partnership with DPS we learned of FloCrit and arranged to volunteer for the Fall Festival in 2017. Our colleagues felt a strong connection to Florence Crittenton’s mission, and they set out to develop a partnership for volunteering on a regular basis. We are constantly inspired by the grit and determination of the FloCrit mothers to both care for their family and succeed in their academics. We love volunteering because we want to support the FloCrit families as they work to reach their dreams. How long have you been volunteering with FloCrit? Pinnacol in Action has partnered with FloCrit for two years. With which activities/events have you helped at FloCrit? Pinnacol’s volunteers have participated in various family events, including the Mother’s Day Tea, Back to School Bash and the Fall Festival. 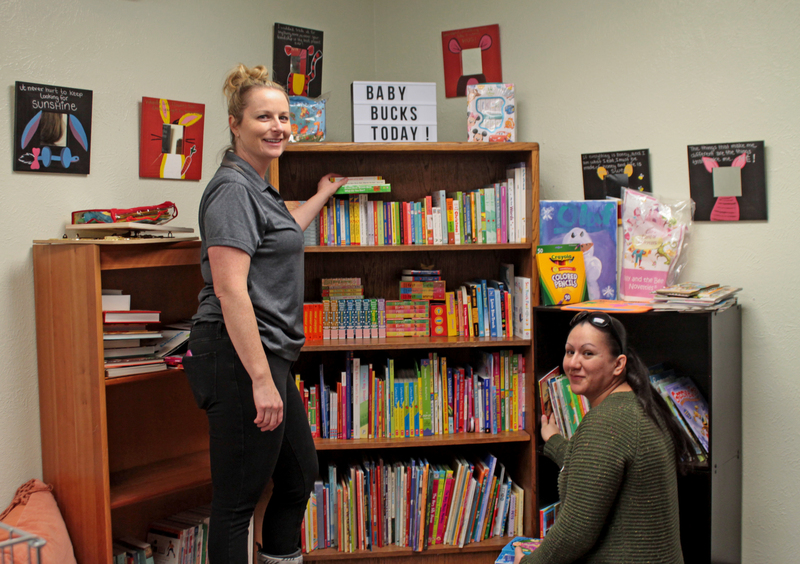 Volunteers have also worked in the Baby Bucks school store and cuddled babies in the Early Childhood Education Center. How does volunteering with FloCrit fit into your company’s priorities? At Pinnacol, our vision is “to lead a revolution of caring for people, businesses, and our community.” This means that we need to live our vision for Coloradans every day, and one way we do this is by volunteering at the Colorado non-profits doing amazing work. Our Pinnacol in Action volunteer program has an 80% employee participation rate and 14 Denver partners, including Florence Crittenton. At FloCrit, we get the chance to support an amazing organization that is dedicated to educating and empowering women and children. What would you say to a group/company that is looking for a place to volunteer and considering FloCrit? Teen families face unique challenges while trying to take care of themselves and finish their education. Florence Crittenton has a rich history of identifying the needs of teen moms and developing strategies to meet those needs. From education, to health care, to career planning and more, FloCrit provides a whole-person embrace to ensure the success of their students. Volunteering at FloCrit is an opportunity to help embrace and lift the teen families as they work towards their goals. Each volunteer experience with Florence Crittenton is fulfilling and engaging. The program is well-run and well-organized. Volunteers connect whole-heartedly with the mission of the organization and feel like they are making a significant impact with their time They enjoy interacting with the mothers and children and leave feeling as if they made an important difference. We whole-heartedly recommend organizations partner with Florence Crittenton.